You have insurance for your home, auto insurance for your vehicle, and an umbrella policy. That’s three different sets of deductibles, limits, and premiums. 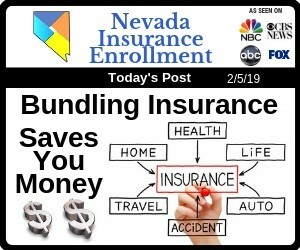 Bundling is a great way to simplify all of that into a single easy-to-manage policy while also saving you money every month on your auto insurance or homeowners insurance. The biggest reason to bundle your insurance policies is that you can save money on your monthly premium, which may allow you to get better coverage than you could otherwise afford. However, there are other reasons that bundling makes sense. For example, rather than having to keep track of several insurance bills every month, each with their own due date, you have just one bill that covers everything. Perhaps the most important reason to bundle your insurance policies is the money you could save on your deductibles if there is a natural disaster. If a strong storm hits Las Vegas, Nevada and your home is damaged from wind, hail, or lightning, you’ll pay a deductible when you file a homeowner’s insurance claim to get the damage repaired and an auto insurance deductible to take care of any damage done to your vehicle. However, if you have your homeowner’s insurance and your auto insurance bundled, one deductible takes care of everything. For most people, bundling their insurance policies is a no-brainer. Even so, there are a few reasons that it may not work out in your favor. For example, bundling could make you ineligible for certain discounts that you would otherwise qualify for. It’s also worth noting that not all insurance policies can be bundled. Additionally, the discounts that you received for bundling insurance can drop off over time, leaving you paying a standard rate. In most cases, bundling your policies saves you money. However, that doesn’t necessarily mean that you’re getting the best rate for your coverage. Even with a multi-policy discount, you may still be overpaying. It’s a good idea to shop around occasionally to make sure that you’re getting the best deal. This is easier said than done. Not only do you have to consider whether your premium would be better with a new insurance company, but you have to look at how unbundling your policies will affect everything across the board. For example, say that you have your auto insurance and homeowner’s insurance bundled. The cost for your auto insurance is going up, so you comparison shop and find another company that will offer you the same coverage for $30 less per month. Before you unbundle your policies, determine whether losing the multi-policy discount will offset any savings you’d get by switching one policy to another insurer. Our auto insurance agents are here to help you get the best coverage for your budget. We can help you look at your needs, current coverage, and other insurance policies to determine whether bundling is right for you. Give us a call today to get started. DISCLAIMER: Each insurance company may handle discounts and bundling differently. It’s important to speak with your agent on how your insurance company works on bundling and discounts.